Have you seen the new Rain Repellent 500ml trigger spray yet? 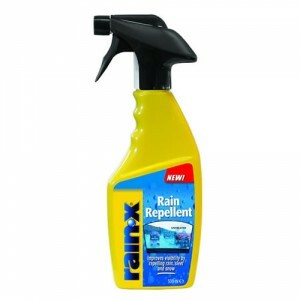 > News > Have you seen the new Rain-X Rain Repellent 500ml trigger spray yet? Repair your windscreen with no fuss…Rain-X Plastic Water Repellent for windscreens and helmet visors – Now Available! Have you seen the new Rain-X Rain Repellent 500ml trigger spray yet? Rain-X Rain Repellent is now available in a 500ml trigger spray bottle from Halfords. It contains the same great formula as the 200ml solution, but the trigger spray functionality enables for a quicker application, preferred by some to save time. The water beading technology means that a freshly coated windscreen will repel water when travelling at speeds of 30MPH and over – always use wipers as necessary! Only a small amount of Rain-X Rain Repellent is required when applying to a thoroughly clean windscreen for a fully effective result, so this 500ml bottle will last much longer and also be handy for those jobs around the home. Rain-X Rain Repellent I suitable for use on external windows and clear glass, non-etched shower doors and ensure that any dirt, grime or soap scum is repelled for easier cleaning. The Rain Repellent solution bonds glass to create a transparent, hydrophobic coating that will repel rain, sleet and snow. It also makes for easier clearing of ice on those cold and frosty mornings. Rain-X Rain Repellent 500ml is available from Halfords and all good automotive retailers.